Most limited edition prints illustrated are in stock and well below gallery retail prices! Lowry signed Limited editions prints and lithographs for sale. Browse through the studio in Nottinghamshire, or arrange a viewing of paintings and prints at your home/office. Click on images or buttons below to view the selection of signed limited edition prints for sale. The artist L.S. Lowry who died in 1976 aged eighty eight was 51 years old before he was nationally recognised as an outstanding British artist. Known widely as 'The Lancashire Painter', he was in fact, the painter of an era. That era was the industrial Lancashire and Cheshire of the 1914-18 war, which he interpreted so powerfully and individually that a visitor to an exhibition of his works saw the streets outside the gallery through Lowry's eyes. Asked how he would set about painting Lancashire of the 1960s, he replied; 'My dear sir, I would not try.' If he was not entirely free from some bitterness over long delayed recognition, he was not soured by it.Perhaps out of a desire to see that young painters should not suffer his fate, he was always eager to stress their merits. Laurence Stephen Lowry was born at Old Trafford, Manchester, only son of R.S.M. Lowry an estate agent, and Elizabeth Hobson. He realized early in life that he wished to paint, though from his mother he inherited a love of music. Later the family moved to Rusholme, and in 1909 to Pendlebury, a move that was to have great significance for Lowry as a painter. There he remained until 1948, his father having died in 1932 and his mother in 1939. Lowry himself moved to Mottram-in-Longdendale, Cheshire, but paid constant visits to his youthful sketching ground. He studied at Manchester College of Art and Design, and at the Peel Park Technical College, Salford. In 1918 he became a student of the Manchester Academy of Fine Arts, of which he subsequently became an honarary member after first exhibiting in 1932. In Lowry's student drawings, many of which were seen at Salford City Art Gallery, there was little, if any, suggestion of the artist that was to be. In fact, it was the accident of missing a train to Manchester from Pendlebury in 1916 that set him on the road that won him belated acclaim. He left the station and wandering round the streets, found his first inspiration for the work of a lifetime in a tall spinning mill. But until he had his first London exhibition at Lefevre Gallery in 1939, he was practically unknown outside the Manchester area. But there, his was a different story. Manchester City Art Gallery bought its first Lowry, 'An Accident' (in fact a suicide), set in Pendlebury in 1926, the first of his paintings to enter a public collection and later acquired several more. Salford had also begun building up what is now one of the finest collections of Lowry's work in the country. More exhibitions in London followed and interest in his work grew. The Tate Gallery bought a painting and his work entered the Royal Collection. Important retrospective exhibitions were held at Salford in 1941 and 1951, at Wakefield in 1955, Manchester in 1959, Sheffield in 1962 and Abbot Hall art gallery 1964. These culminated in the Art's Council's large retrospective exhibition at the Tate Gallery in November, 1966. In 1964 a special birthday concert was given by the Halle Orchestra at the Free Trade Hall Manchester. 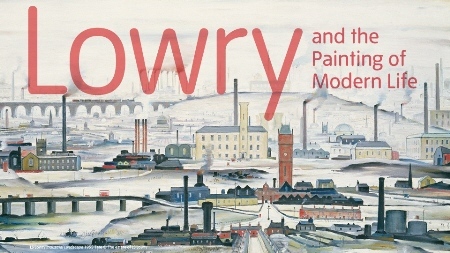 Lowry remained steadfastly faithful to the Northern scene. Though in the 1960s he found new stimulus in Sunderland and Newcastle and produced some rather whimsical paintings like 'The Carriage' bought by the Queen in 1962, it was in close contact with the Manchester area that he produced his most memorable work. In February 1971, he paid one of his rare visits to London for the opening of an exhibition of 60 of his drawings at the Lefevre Gallery, Bruton Street. He lived alone and was often referred to as 'The Lonely Painter.' Perhaps he was, but on the other hand, no man appeciated the independence and freedom of the solitary existence better than this provincial master who won himself a place in the history of English art. Lowry signed Prints and Lithographs. There are approximately 54 signed Lowry prints (signed, limited edition print titles) by and 17 lithographic prints. Approximately 26 unsigned, Lowry limited edition prints. Numerous open edition, poster prints of decorative not numbered or personally signed, of decorative value only, were published. The signed prints usually have an embossed stamp, by the Fine art trade guild, or that of the publisher. Some print titles are simply signed by the artist and numbered. Several print titles eg. 'Mill scene' print, 'Level crossing' print, and 'Market scene' print are simply signed in pencil by L.S. Lowry. Lowry both liked and understood these industrial areas, he had no need to travel abroad, journeying from one side of the city to the other gave him all the depth he required for his paintings. One of his first reviewers, Bernard Taylor, commented in 1921. Lowry's portrait of Lancashire is more grimly like that of a caricature, because it is done with the intimacy of affection.